Too Slow For Optimal Coral Growth? Since the 20th century began, global sea levels have been rising at rates of about 1.7 – 1.8 mm/year, or about 0.17 to 0.18 of a meter (~7 inches) per century. In contrast, during the middle Holocene, sea levels rose at rates of 9.6 mm/yr (0.96 of a meter per century) during the 350 years between 6,850 to 6,500 years ago (Meltzner et al., 2017), and relative sea levels (RSL) were about 1 to 2 meters higher than present during that time. 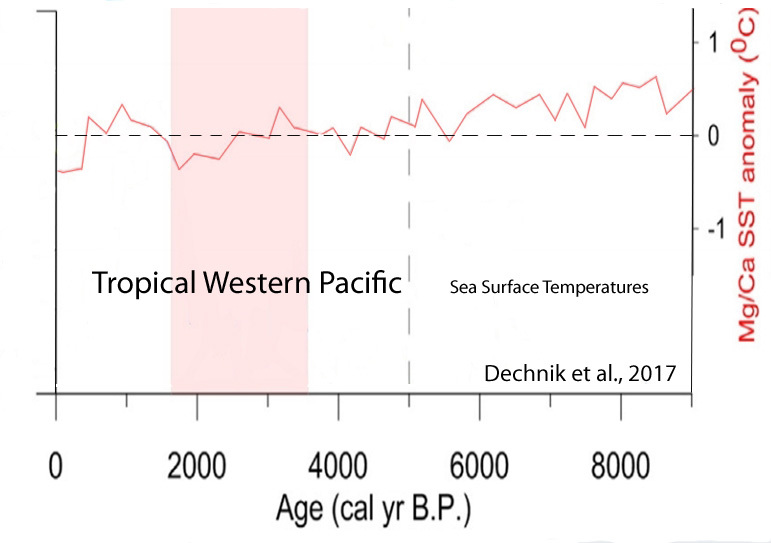 During the Early Holocene (~12,000 to 8,000 years ago), sea levels rose at rates of about 0.74 of a meter to to almost 1.1 meter per century (7.4 mm/yr to 10.9 mm/yr), which is about 5 to 6 times the modern rate (Khan et al., 2017). Corals, thought to be biologically fragile and highly susceptible to abrupt sea level changes and high sea temperatures…survived these much higher rates of sea level rise from the geological past. Scientists have apparently found that coral communities do not grow as well, but instead they “shut down” — even reaching very high mortality rates (85%) — when sea levels fall rapidly. Falling sea levels (and cooling) are suggested to be more lethal to corals than high-temperature bleaching events during El Niño years or rising sea levels (Eghbert et al., 2017). These findings would not appear to support the current perspective that modern coral communities are threatened by “global” warming and rapidly rising sea levels. “It doesn’t take a genius to work out that lack of water kills creatures that live under it. I have an ocean to sell to you. Just call! sod, so you claim that coral polyps can live above sealevel? Or did you just not understand what you were answering to? sod, are we in agreement about what a polyp *IS*? It’s the squishy part of a coral. sob is flapping like a mullet out of water… yet again !!! Half of all scientists that ever lived are alive today. And they need to eat too. Yeah Sod I’ve got some snake oil you can buy. To prevent oxidation I put CO2 from my mig welder inert gas bottle in the top of the container before sealing it. For all the supposedly scary indicators of Climate Change, I’d be much more scared if they were going in the opposite direction, number 1 being a falling sea level. Global warming is little more than rising WINTER NIGHTTIME temperatures, we are supposed to be scared of that? I would think it would be better just to let these comments fizzle out rather than reply.It’s not worth the trouble. It’s insatiable. You could start a movement across comments sections on line.